GAME 4 of the Western Conference Finals turned into a Kevin Durant show as the 3-time NBA scoring champion went on a fourth quarter rampage and carried the Oklahoma City Thunder to a 109-103 victory over the San Antonio Spurs Saturday night at the Chesapeake Energy Arena in Oklahoma. The best-of-7 series is now tied at 2-2 with Game 5 set Monday night at the AT&T Center in San Antonio. 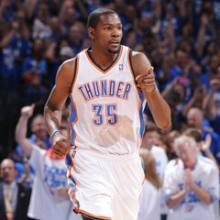 Durant's outburst began in the 6:33 mark of the final period, where he drilled 16 consecutive points. He then added a pair of free throws in the final 20 seconds of play to wrap a bow on the Thunder win. Durant's one-man assault turned back the Spurs, who had cut a 15-point deficit down to four, 86-82. "I just want to be calm and composed in those situations and make the right basketball play. I just try to be calm and go with my instincts," said Durant, who finished with a game-high 36 points with 8 rebounds and 6 assists. "When a player that talented gets hot, he's really hard to contain. We tried different things and didn't work. We made a great effort in the second half but we just couldn't contain him down the stretch," Spurs sixth man Manu Ginobili, who finished with 13 points, told NBA.com. Before Durant took over, the Thunder drew a lot of offensive firepower from their big men. Serge Ibaka shot exceptionally well, 11-of-11 field goals for 26 points. Kendrick Perkins had 15 on an equally impressive 7-for-9 outing while Nick Collison added a modest eight points. ALL-STAR point guard Russell Westbrook was held to 7 points and 5 assists but reigning Sixth Man of the Year James Harden picked up the slack with 11. The Thunder made 44 of 78 field goals for a high 56.4 percent rate. They sank 5-of-13 threes (38.5 percent) and 16-of-21 free throws (76.2 percent). The beauty of OKC's passing game showed with 27 assists, while the usually efficient Spurs only had 17. The Thunder won the rebounds battle, 41-31, and they had two less turnovers than San Antonio, 12-10. Tim Duncan had 21 points and 8 rebounds for San Antonio, which shot a decent 41-of-82 from the field and a notable 11-of23 above the 3-point arc. But the Spurs missed 6 of 16 free throws. Kawhi Leonard had 17 points for San Antonio while Tony Parker, who struggled making only 5 of 15 shots, finished with 12 points and 5 assists.